Rediff.com » News » Is India forever condemned to live with corruption? Is India forever condemned to live with corruption? 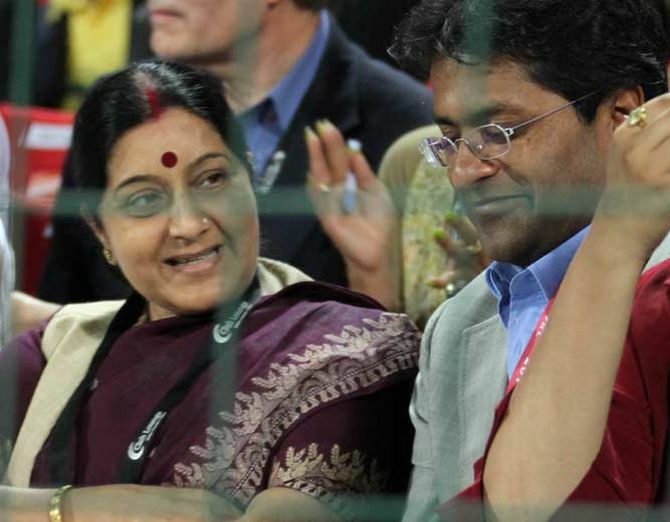 The recent Lalit Modi affair has raised two serious questions about corruption in India. Why has India's vibrant democracy not been able to check corruption? And are we condemned forever to live with corruption far higher than that in many developed countries in the West? Almost 2,500 years ago, Kautilya captured the seductive power of graft by comparing it with resisting honey that has been placed at the tip of your tongue. Detecting the misappropriation of funds by public functionaries is akin to detecting when a fish is drinking water. Kautilya was writing before the advent of effective and independent media, an independent judiciary or the other checks and balances that come with democracy. Yet his basic insight was right. Corruption is there in almost every country, only its intensity and scale varies. Authoritarian regimes produce the most egregious cases. Ferdinand Marcos of the Philippines, for example, is said to have embezzled over $5 billion during his 21-year presidency. Mobutu Sese Seko captured power in Congo by overthrowing Patrice Lumumba, renamed the country Zaire and may be remembered more for his Concorde-flown shopping trips to Paris. But corruption is not limited to authoritarian regimes or the developing world alone. Even today's "clean" Western democracies had their share of severe corruption problems in the past. In 1894, the going rate for a captaincy in the New York City Police Department was $10,000. Through Tammany Hall machine politics, "Boss" Tweed ruled Democratic Party politics in New York, controlled the courts, the legislature, the treasury and the ballot box in the mid-1850s, and was a Congressman. Developed countries have reduced corruption but not succeeded in eliminating the problem. Even as recently as 1971, Spiro Agnew, first vice-president under Richard Nixon in the United States, had to resign for taking a $25,000 bribe for a construction contract. In 1983, Kakuei Tanaka, prime minister of Japan during 1972-74, was sentenced to four years' imprisonment for taking a $1.8-million bribe from Lockheed Corporation in return for the purchase of 21 L-1011 aircrafts in 1972. It is well recognised, though, that corruption is less of a problem in developed countries. Poverty exacerbates corruption not because the poor are amoral, but because people in power find underhand means the most convenient way of getting rich fast. By slowing down development, corruption itself can be a poverty-trap. India has made considerable progress in reducing poverty in six decades since Independence. But why even with a vibrant democracy in India has corruption, or at least the perception of it, not come down more rapidly? There was an expectation that the practice of a liberal democracy would root corruption out. A vibrant media would discover and publicise corruption. A boisterous opposition would make an issue out of it. An independent judiciary would bring the culprits to book, and the voters would throw the suspects out of office. All of these have happened, but not in sufficient strength to adequately control the curse of corruption and curtail its embarrassing scale. The answer to this question perhaps lies in insufficient growth and slow economic development. Political scientist Samuel Huntington, in his controversial book Political Order in Changing Societies in 1968, observed that where political opportunities are scarce, corruption occurs as people use wealth to buy power. And where economic opportunities are few, corruption occurs when political power is used to pursue wealth. The argument is best illustrated by a comparison of India and China. Indeed China also has its corruption problem. But compared with corruption in India, which is "rent-seeking" and an attempt to grab a part of the existing wealth, corruption in China is "profit-sharing" à la Jagdish Bhagwati. The Communist Party puts a straw in the milk-shake and wants the milk-shake to grow. For example, Liaoning province under Bo Xilai as governor consistently achieved double-digit growth. But Bo Xilai, a member of the central politburo and secretary of the Chinese Communist Party's Chongqing branch until March 2012, was found guilty of corruption, stripped of all his assets and sentenced to life imprisonment on September 22, 2013. Authoritarian China has a corruption level not much higher than that of democratic India. For example, in 2014, according to the Transparency International's Corruption Perception Index, China's score at 38 out of 100 was only marginally worse than India's 36. Access to China's entrenched political elite is limited, but economic opportunities abound. In India, on the other hand, political opportunities exceed economic opportunities. It is easier to become an elected representative than a successful businessman. In India, with elite accessibility, numerous political opportunities and economic scarcities, the tendency is to rely on patronage to solidify power and amass gains as quickly as possible. Democracy is a necessary but not a sufficient condition for rooting out corruption. Corruption depends on the political and economic structure of the country as well as cultural and individual moral factors. Fortunately, India has a thriving democracy and the electorate continues to reject corruption as a "given fact of life". A CNN-IBN-Centre for the Study of Developing Societies all-India post-poll survey of 22,301 respondents, after the 2014 Lok Sabha election, found that corruption was the single most important issue while voting, second only to inflation. Corruption in India is not like the weather that people can talk but do nothing about. The electorate even seem to vote against parties allegedly involved in corruption scandals. Corruption in the United States a hundred years ago was of a different order of magnitude than today. Even India is also not destined to live forever with high levels of corruption. The fight against corruption is going to get easier as economic opportunities expand with accelerating growth and access to information and aversion to corruption improves with expanding education.